In the world of home improvement, there are few projects that are more immediately visible and have such a dramatic effect on your property as a good fence. From curb appeal to security to a whole host of others, installing a new fence is a project that should be high on your list. This week, we’re going to discuss some of the reasons why you should install a residential fence on your property. Curb Appeal – Curb appeal is the impression someone who is walking along the sidewalk or driving by gets when they see your home from the curb. A beautiful fence will be one of the first things that stands out to a passerby. As a hardworking homeowner, you’re proud of your home, and you want it to stand out. Installing a fence is one of the easiest and most rewarding ways to do so. Customization – There are so many fencing options available that it would be hard for you to find something you didn’t like. In fact, you’ll probably have the opposite problem: choosing just one out of so many great options! Whether it’s a classic wood picket fence painted white, or a stately ornate iron fence, you can pick whatever material, color, size, and shape that you want. 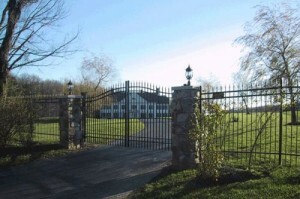 Aesthetic – Fences can really define the aesthetic of a home. Your two-story colonial wouldn’t be complete without that wood fence, and that old 19th century mansion would be complemented perfectly with an iron fence. 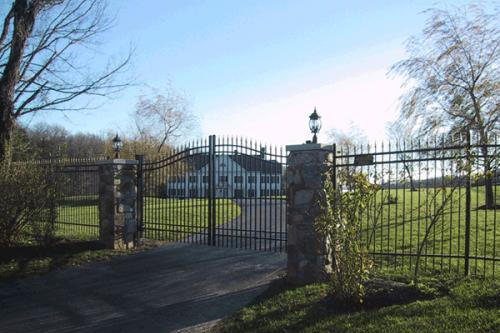 Security – Fences are the first line of defense for your home, providing safety, security, and peace of mind for your family. By integrating an alarm system, you can further protect your home from unwanted guests. Fences also create safe spaces in the yard for children and pets to play, where you can keep an eye on them without worrying about them wandering off. Home Value – When it comes time to sell, all of these benefits of installing a residential fence will translate into a boost in your home’s value. This entry was posted on Thursday, April 17th, 2014 at 4:14 pm. Both comments and pings are currently closed.